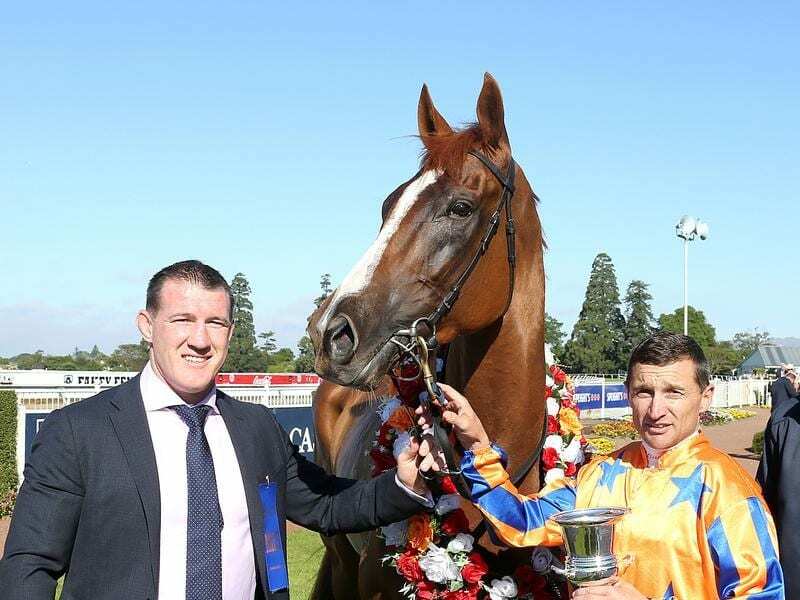 Te Akau Shark, part-owned by Cronulla Sharks captain Paul Gallen (l) will miss the autumn. New Zealand star Te Akau Shark has suffered a setback and will miss the autumn. Te Akau Racing did not disclose the nature of the setback but said on Twitter the horse would be back for the spring. “Te Akau Shark is unlikely to race in the autumn due to a small set back – he’s a lovely lad and we look forward to having him back in the Spring” Te Akau said. The four-year-old has won five of his six starts and had been entered for the $5 million All Star Mile at Flemington on March 16. His biggest win so far came in November in the Group Two Couplands Mile which he won by six lengths.